Mike Mutebi gives his players instructions in a training session. 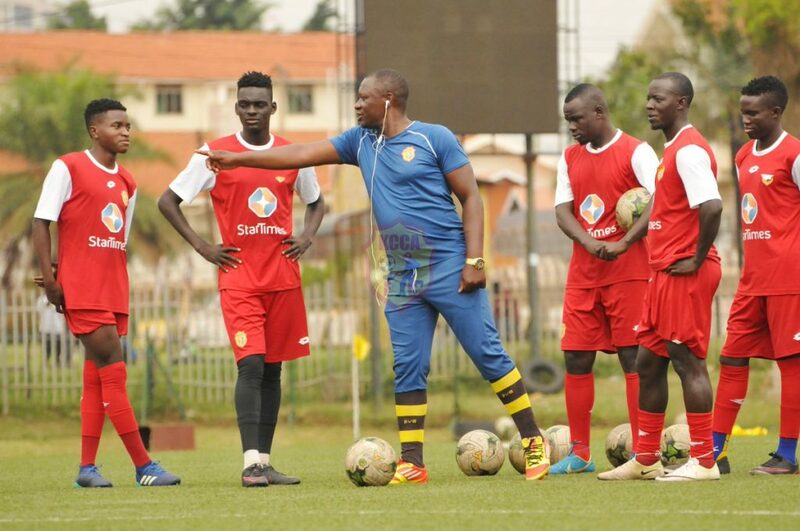 KCCA FC gaffer Mike Hillary Mutebi has come out to say it’s all or nothing ahead of his side’s clash with AS Otoho of Congo which has a three-goal advantage heading into this tie. We are going to do it the hard way, but we have the capacity to correct the result. My players have a lot of belief that they can do it. It is important that the players do believe because they are the ones that do play on the field. Just as AS Otoho scored three goals in Congo, we too can score three or more here. We have gathered enough experience on the continent to negotiate such ties. It is all or nothing, we have to score goals and it is going to be attack attack attack, but with discipline so that we do not concede. Eric Ssenjobe, Jackson Nunda and Sadam Juma are out injured. Mustafa Kizza is to be assessed before kickoff and hopefully he can pass the late fitness test. Peter Magambo returns from injury and is in contention to start. The rest of the players are all available for selection. KCCA FC lost 3-0 against AS Otoho in the first leg away in Congo Brazzaville and will be hoping to overturn the result on Sunday 20th January at Startimes Stadium, Lugogo. ← KCCA Executive Director Visits KCCA FC, Assures Club of Full Support.